When given the opportunity the design of new gardens can be greatly enhanced by the addition of large plant material. In particular, larger-caliper trees engender a mature feeling for a garden space, making even the newest installation appear ageless. However, the logistics of planting a large tree can be daunting. Costs are commensurately higher, and the degree of difficulty quickly intensifies as plant sizes increase…so the margins for error become razor-thin. At this project, a beautiful Swamp White Oak was tagged at a nursery, dug, and delivered to the project site. Access to the tree’s final location was very limited. Below-grade utilities and the size of the tree root ball itself both conspired against the use of more conventional tree spade equipment for the installation…alternative strategies were required. 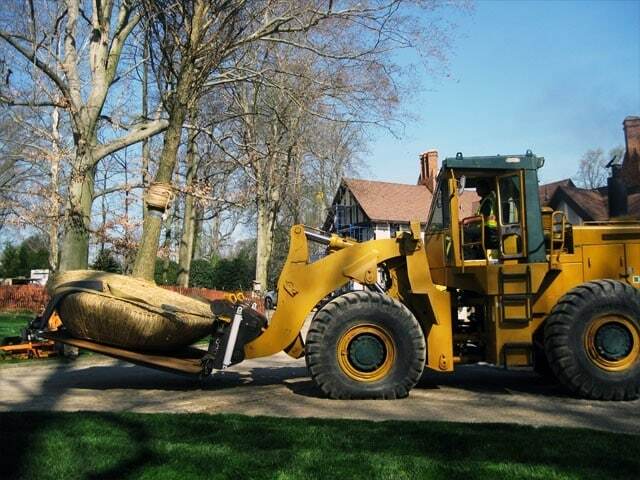 A large loader with a specially designed front plate was used to unload the tree at the street and carefully transport it across the property. Near where the tree was to be installed, the loader set the tree down on level ground. 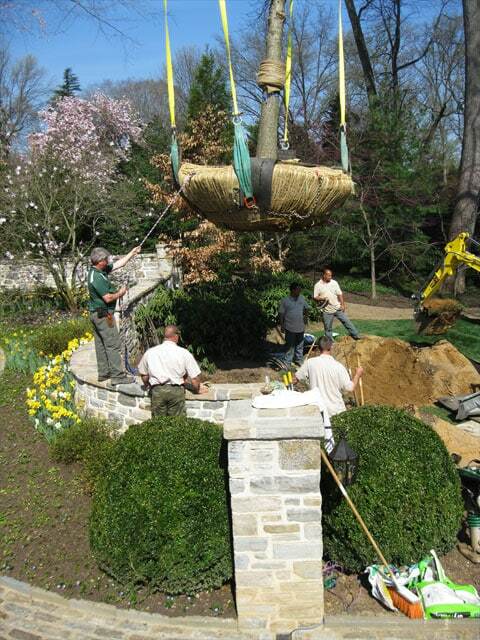 Next, a crane with specially designed rigging was used to pick up the tree, lift it over an existing wall, and set it in the planting hole. 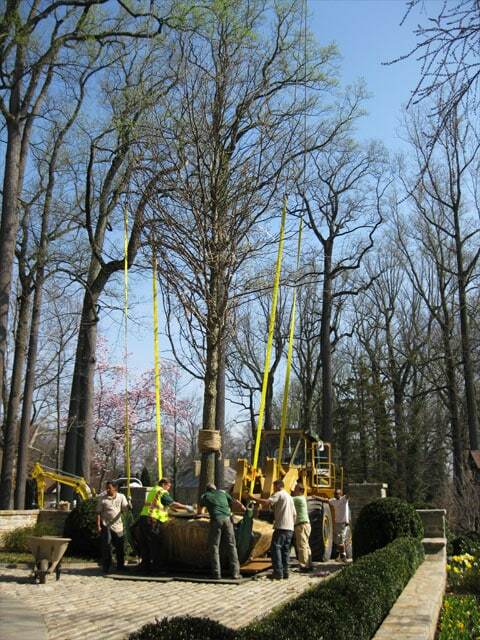 The tree had to be lifted and reset several times as the installation crews worked to make sure the tree was straight and the height of the root ball relative to final grade was correct. Finally, once the tree was positioned properly the crane rigging was detached, the drum lacing removed, and the root ball backfilled. About three hours were needed from the time the tree arrived until the installation was finished. A note of gratitude goes out to the installation team for their successful coordinated effort: Halka Nurseries, Paragon Landscaping Corporation, Trees In Travel, Sautter Crane, and Griffiths Construction.